As we go to press, L’ag ba-Omer is but days away, and, with it, comes the promise of Shavuot: zman matan Torateinu. With all that Shavuot planning entails (davening, learning and/or teaching, delicious foods), Congregation Beth Aaaron’s Kol ha-Ne’arim Chuppah Project Committee already is preparing for the next celebration of our Torah – Simchat Torah. On that day, as you well know, our children stand under the Chuppah as we extend our bracha, asking that they continue to engage in Torah and mitzvot, practicing the guiding principles of Jewish life. The beautiful Chuppah that we use displays the names of our children, grandchildren, and great-grandchildren. 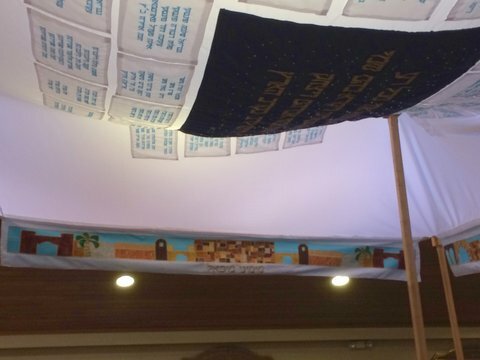 Each year, we allow our Beth Aaron family the opportunity to add new names to the “ceiling” of the Chuppah. If you would like to add the name of a child this year, please follow the instructions below to submit his/her name(s); please check your spelling! The cost is $1.50 per letter. The deadline for the submission of names is July 13. After that date, we cannot guarantee that the names will be embroidered in time for Simchat Torah this year. The website also displays photos of the Chuppah as well as opportunities to dedicate a section of the Chuppah (interior and exterior valances, support pillars) in honor of, or memory of, a loved one. These sponsorships include the names of children, grand-children etc., without a limit and at no additional cost. The names of donors also will be displayed on a plaque in the shul lobby. Each listing will include first and last names in Hebrew only. Please click on the "Aleph" at the right of each box below to bring up the Hebrew keyboard. Names should be submitted in Hebrew only. At your option, you may choose to include middle names. The cost is $1.50 per letter. The name of the valence. If it is the interior or exterior of the chuppah. The name of the street outside the shul to which it is parallel. The cost of the valance and whether is has been sold. The four valances have exterior panels facing the congregants and interior panels surrounding the children when they stand under the chuppah to get their aliyah. 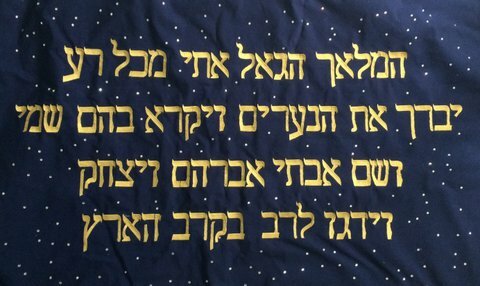 The longer exterior panels are embroidered with the Shabbat bracha said over a girl or boy. The shorter exterior panels have pesukim embroidered on them. Four angels are embroidered on the inside of the valences: Gavr'iel, Rafa'el, Micha'el and Uri'el. The panels with the name of the same angel are sewn together to create the valence for that side. Questions may be referred to Myron Chaitovsky, myron.chaitovsky@gmail.com.